The feed circuit, especially restrictive feed outlets like drippers, can become blocked with salt build-up, dirt, algae, root growth and medium. 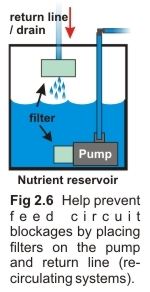 ● Employ a filter on the inlet to the nutrient pump. Also, in recirculating systems, install a filter in the return line (Fig 2.6). Ensure filters have a large surface area. This will minimize how frequently they need to be cleaned. ● Position plants to avoid roots being drawn into drain outlets. ● Maintain nutrient pH well below 6.5 to help prevent precipitation. ● Routinely disinfect the nutrient solution to prevent the build-up of algae and slimes. ● Ensure nutrients are fully soluble. ● Avoid using water that has high “hardness” levels. ● Use stakes to secure the feed outlets above and away from the medium and roots to prevent them from becoming blocked. ● Where drippers or sprayers are used, allocate at least two per plant. Inspect and clean them regularly. ● Use a regular maintenance schedule. Routine 'discarding' and 'flushing' will help prevent the build-up of solids such as insoluble salts, algae and plant debris. Between crops it is useful to perform a chemical flush to remove insoluble precipitates.